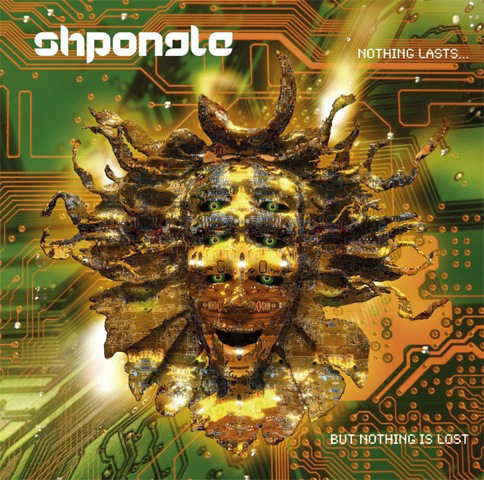 Having released two albums, made an international name for themselves on the dance scene for their sonic manipulations, Shpongle are back, with a new album, 'Nothing Lasts' a reference to Terence Mckenna and one of their many influences, the imitable audio pioneers, Simon Posford & Raja Ram remind us not only the about the impermenance of life but also how to rewrite the ambient agenda with yet more spell binding music from their outer cosmos that is 'Shpongle'. With sonic waves in a sea of synths, battalions of brazilian batucada beats, flamenco solo's, piano solo's, vocal soarings from Hari Om and trancey dubs this really is more music from the otherworld. A place of undefinable and indescribable beauty where all cultures collide, genres are rode over roughshot, and nothing is outlawed. For those that know them these will be sentiments they recognise and welcome as further evidence of Shongle's reputation. To those that don't, welcome to a new universe one with it's own language and musical map, a place of beauty and impermenance. Shpongle has been a unique phenomenon, selling over 50,000 albums through word of mouth alone, giving them an enviable underground and worldwide reputation. Their albums continue to sell well as other trendier phenomena rise and fall; Shpongle’s fanbase expands worldwide growing all the time. This is the 3rd and possibly final album from this truly unique band.